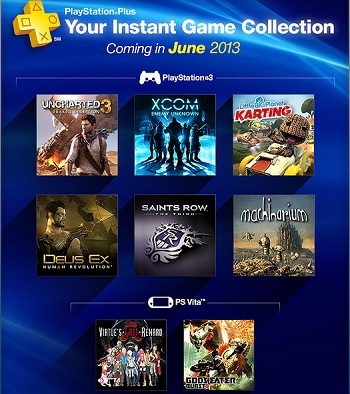 Sony has revealed it will be adding three more games to PlayStation Plus Instant Library line-up for June. If you haven't heard of PlayStation Plus, it's Sony's service where you pay a subscription fee (about $5 a month) and gain access to cloud storage, discounts on PSN goods and, perhaps best of all, access to free games. At first thought you might assume the service is loaded down with games you wouldn't want to touch with a ten-foot clown pole, but it actually features quite a few quality titles, including some of Sony and friend's biggest name franchises. For instance, the month of June has already seen Deus Ex: Human Revolution added to the service's Instant Library of downloadable games. Now, Sony has announced that it will also be throwing in the single-player campaign from Uncharted 3: Drake's Deception, XCOM: Enemy Unknown and LittleBigPlanet: Karting, as well. Uncharted 3's multiplayer was already been made available to PSN members earlier this year and allowed gamers to play, free-of-charge, up to level 15. All three games should be joining the Instant Library next week. They'll be followed, later this month, by Machinarium, Saints Row The Third, Zero Escape: Virtue's Last Reward and God Eater Burst, which makes June a pretty good month for subscribers, whether they own a PS3 or Vita. It's worth noting that you only get access to the Instant Library for the duration of your subscription, but considering that XCOM on its own will cost you $39.99 in the PlayStation Store, it's a pretty good deal if you can let go of the need to own the game.